A friend asked what part of making a dulcimer I enjoy the most. After some thought I realized I enjoy all aspects of dulcimer construction for different reasons. I enjoy going to the sawmill and digging through stacks of wood and talking with others I meet who have a love and appreciation for wood. Planing rough-sawn lumber and getting the first glimpse of what is under the saw marks is always a thrill. Everything that follows is also fun. The early stages of getting the work done are more physical; lots of planing at the bench. As the dulcimer progresses the work becomes finer, more detailed and requires greater precision. The rougher work is less demanding of intense focus while the finer work is less physical but requires much more concentration. Once all the parts are glued together there is still a lot of work to do. Once out of the clamps this dulcimer will be prepped for finishing. After that comes varnishing, fretting and set-up. When I need a break from the focus required to do that stuff I jump to rough planing that proceeds making starting the next few dulcimers. I had planed this piece of quartersawn walnut a while back and it has already been resawn at the bandsaw. I’m joining the tops and backs for the next dulcimer in line with wood that came from this board. All this planing may indeed be my favorite part of the process! Haven’t made my own cam clamps but I should someday. 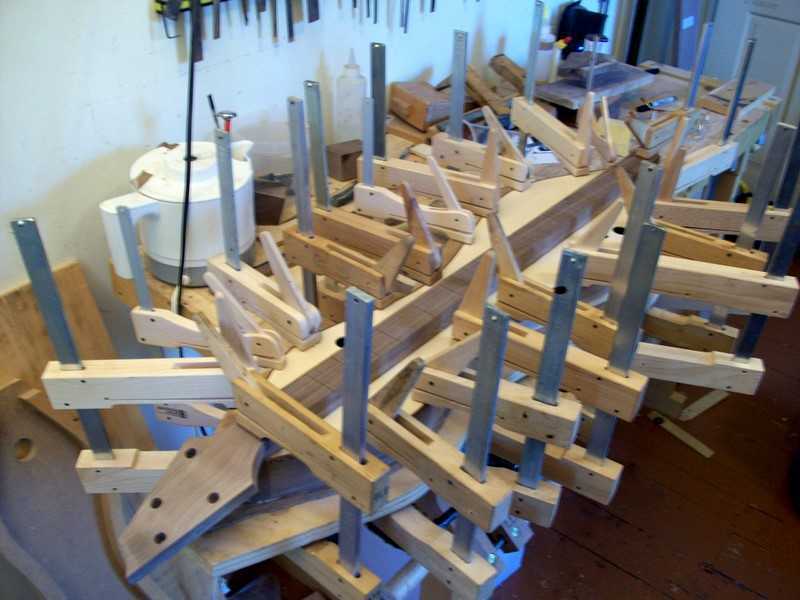 Every one I own was in on that glue up. If you buy some I’d suggest not being tempted by the low price at Grizzly – substandard in my opinion. Glad I only bought a few from them to try them out. 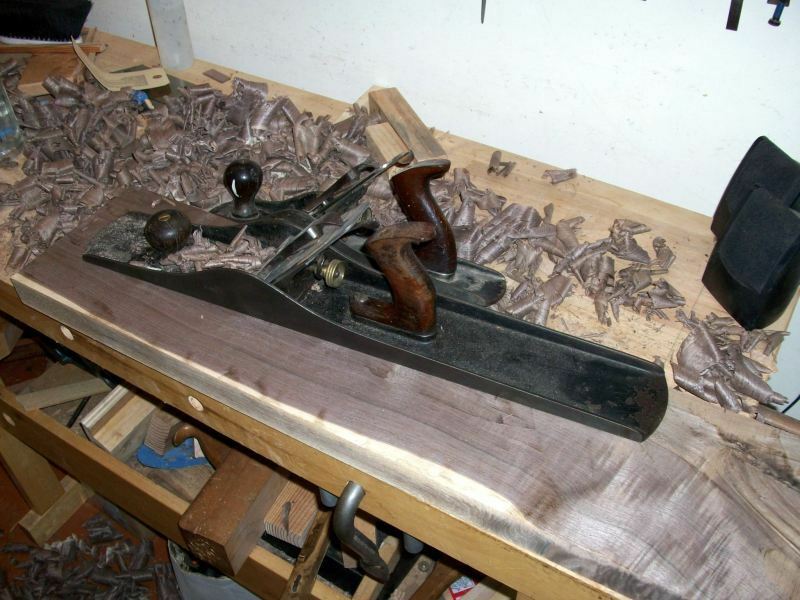 I resaw stock between 4 and 5 inches thick on a funky old Jet bandsaw with a 1/2″ 5 tpi blade. I’ve had good luck with Viking blades I get from Lee Valley. My bandsaw is out of alignment in just about every way possible so I often have to set up the fence to compensate for blade drift. Once I get it set up it works very well. Great post, Doug. Boy, that’s a lot of cam clamps. Have you made your own? I’m thinking of doing so for some jigs I’m planning to build. 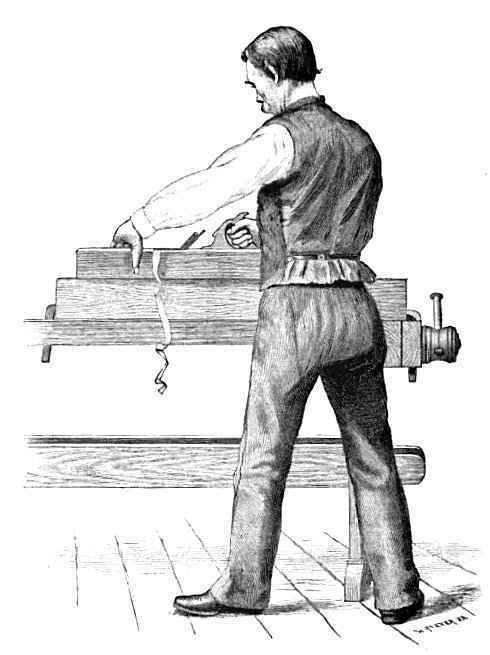 When you resaw the walnut, how wide are the boards? What blade/tooth count works for you? clouds has not yet been aroused from its dreams.